It was a fantastic end to another busy week at Earls Hall! The morning started with Mr Geach hosting another ‘Board Games Club’ for the children in KS1 before school. Once the children had entered class our learning ambassadors of the week met with Mrs Irwin, one of our school governors, where they talked to her about the learning that has been taking place in class throughout the week. Well done to all of this weeks ambassadors, we are proud of you. Later in the morning we held our two simultaneous ‘Celebration Assemblies’ where we rewarded individual children from each class for their effort or achievement. We also presented certificates for times tables and reading races. Well done to all of the children who were rewarded today, we are proud of you. In Sycamore the children investigated the phases of the moon in an extraordinary way by representing them with Oreos! Meanwhile Mr Geach hosted the latest of our ‘AOK Club’ missions which saw a group of children from Year Two take to the streets in a bid to rid them of litter. The children worked in pairs, using the special litter pickers, to collect rubbish from much of Carlton Avenue. 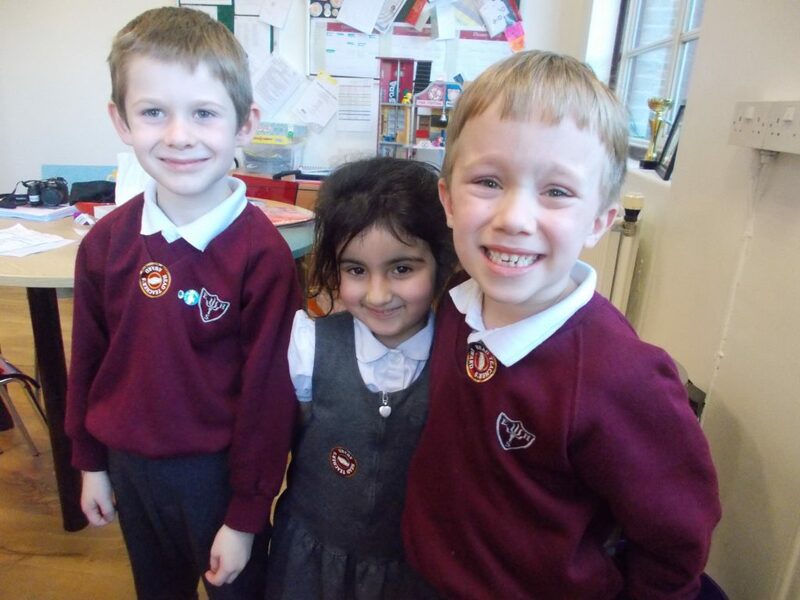 We were proud to present the children with their special badges back in school in recognition of their kindness. Well done children, we are proud of you! At lunchtime the children enjoyed delicious portions of fish and chips and Mr B was joined by a group of children at the centre table who he had noticed were displaying excellent manners in the Woodland Diner. Well done children, we are proud of you. In the afternoon Mr B was treated to some lovely reading sessions by children in Woodpeckers and Squirrels in his office, The children read beautifully and were rewarded with some of his most special stickers for their efforts. Well done children, we are proud of you. There was more reading pride on display across Foundation Stage and KS1 as more and more children were presented with their bronze and silver ‘Reading Champions’ badges. Well done to all of the children who were presented with badges today, we are proud of you! Throughout the day the school began to be transformed in preparation for Christmas. The PTA have donated some amazing trees again this year which the team in school have decorated. Mr B was helped by a group of children from Beech to decorate some smaller artificial trees whilst Mr Geach, Mrs Rick and Mr Gheorge hung lights all around the communal area downstairs. After school a group of children from across the school took part in another ‘Clay Cottage Club’ where they began making some fantastic Christmas themed tea-light holders.